My latest obsession is Bikram yoga. Many people talk about “hot yoga,” but true Bikram is my favorite. It’s a 90 minute session consisting of 26 Hatha yoga poses and 2 breathing exercises designed to deliver total health through the balancing and strengthening of every system in the body. This promotes wellness, prevents injury, and limits the effects of aging. In fact, I think it reverses aging! I was told I look 22 just the other day! (I’m 28 and after working nights for 5 years, smoking cigarettes, and drinking alcohol weekly I looked closer to 40.) Product received for review purposes. This class is held in a room with 70% humidity and kept at 105° F. In these conditions, you don’t just get hot, you literally pour sweat from every part of your body. Toxins are dripping out of your body. Once acclimated you are also able to move easier and increase flexibility. The key is to breathe in and out all through your nose (except for the breathing exercises.) This regulates your heart rate so you can stay focused. As you can probably imagine, just any yoga mat will not do for these conditions. You need something that will absorb all that sweat, not get slippery and keep it from getting on the floor. I was using a thick beach towel over a regular yoga mat but that was getting really obnoxious to deal with. It kept bunching up and/or slipping out of place. All these problems are solved with the Aurorae Synergy Mat. It is made with a micro fiber towel and 5mm eco safe mat. It’s machine washable (just hang to dry) and slip free. And, we wouldn’t want to be sharing all that gross sweat with everyone in the class so it is very important that your mat protect the floor. Just make sure you don’t put your mat in the dryer. Hang to dry. And this durable mat will last a very long time! Aurorae offers yoga mats in illuminating colors, a focal point icon and are extra long in length. 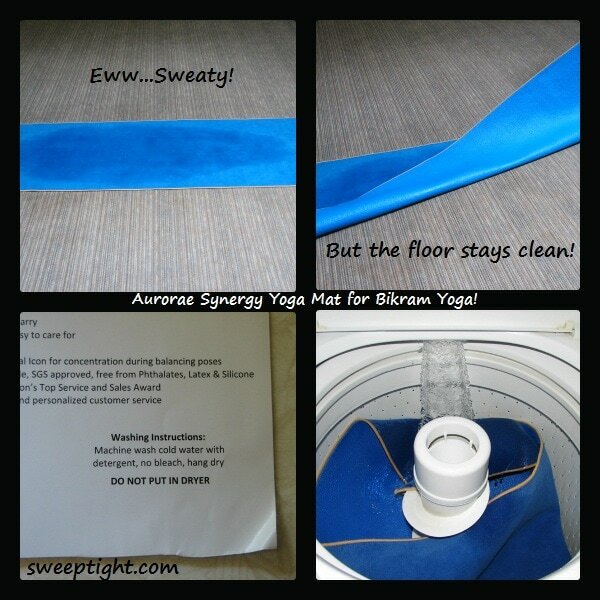 Aurorae offers the best reviewed yoga mats, accessories and props online. Lord knows I could use all the detox I can get! I need this for outdoor boot camp classes! This is awesome. Thanks.